The ENCOM- Enfield America is an example of firearms production methods and thoughts during the 1980's. 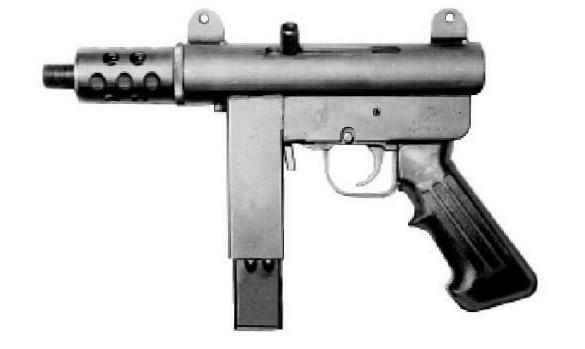 Designed as a semi-automatic pistol the ENCOM was akin to the TEC-9 and Kimbel AP-9 handguns of the period. It was chambered in both .9x19mm-Parabellum and .45-ACP and came in various barrel lengths as well as option for early laser aiming devices of the period. The weapon was capable of being fitted with telescoping wire stocks for longer range shooting. The barrels were interchangeable to allow the weapon to go from a 4.50 inch to 18.50 inch barrel if required. The design however was soon to become unpopular as legislation was passed in numerous states to make the weapon illegal to own, the company having long gone out of business at this point. CALIBER: .9x19mm-Parabellum / 45-ACP WEIGHT: 6 Pounds> MAGAZINE CAPACITY: Box, double-stack column magazines, with either 10, 30, 40 or 50 rounds capacity.